I was recently interviewed for Serena Kovalosky’s site Artful Vagabond as part of her 365-Day Tribute to Artists and the Creative Mind project. As stated on her site, the project “is a series of daily online inspirational articles that celebrates the artistic mind and the creative process. 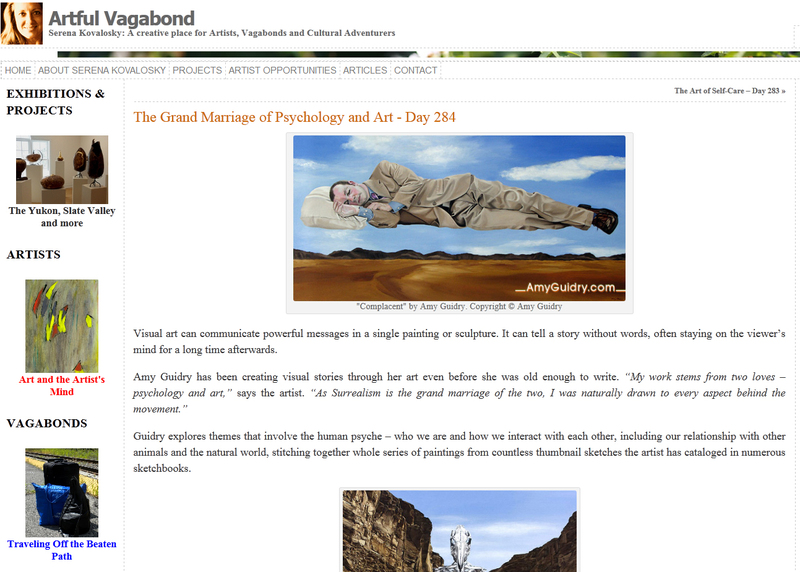 Each post is accompanied by artwork from professional artists around the world.” Check out the post online here: http://www.artfulvagabond.com/the-grand-marriage-of-psychology-and-art-day-284/. Also of note, fellow vegan artist, Allison Bratt did a wonderful write-up about my work on her blog. (You may recall I posted about a painting by Alli that I had purchased for my own art collection.) Read the article here: http://allisonjbratt.com/2012/10/art-spotlight-amy-guidry/.